In 1859, a blacksmith named Christian Zinck opened a hammer works in the old Godthaab paper mill south of Aalborg. Together with his son Niels, he developed the hammer works into a business that was famous throughout Denmark for producing tools and equipment for gardening and farming. In 1868 the original iron waterwheel was replaced by a large turbine that powered the factory machinery until 1977. 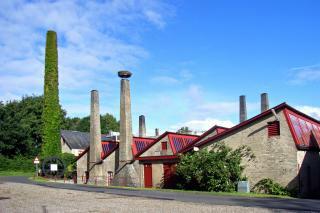 Today, the old buildings and water-powered system have been converted into a museum called Godthaab Hammerværk. The plant is intact and still functions as an example of the earliest Danish business based on water power. Study trip – or early industrial espionage? Christian Zinck was a self-taught blacksmith. Before opening his small water-powered hammer works in Sejlflod in 1845, he went on a study trip to Grejsdalens Hammer Works. The smith is said to have walked all the way from North Jutland to Vejle to sneak a look at the work's water-powered blacksmiths hammer. In 1859, Zinck bought the old Godthaab paper mill and transformed it into a large hammer works. His son Niels trained in Copenhagen but was summoned home. His father met him with a question: Have you any money, Niels?" Niels had to loan his father 50 rix-dollars to get the paperwork in order. That worried him more than a little. But before long, the waterwheel at the hammer works was turning steadily and money was flowing in. "